Antwerp is located in the northwest corner of Paulding County. 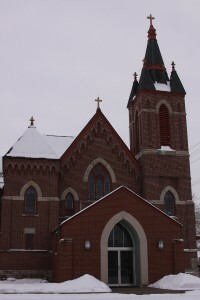 St. Mary parish was organized in 1864 and the first church was built in 1867. It was constructed of wood, forty-six feet long and twenty-six feet wide. This building remained in use until 1901 when the present church was constructed. The first pastoral residence was built in the early 1870s and the present brick residence was finished in 1911. A parish school was opened in 1915 but was discontinued in 1913 due to meager finances and the small number of children. The school building today is used as the parish hall. The history of the parish and the history of the Wabash Canal are closely connected. The canal brought Catholic families into the district of the Black Swamp: German, Irish and French. This parish is one of the oldest parishes in Paulding County and the Mother parish of many of the surrounding churches which were started originally as missions of Antwerp, St. Mary.On July 1, 2008 St. Mary’s Parish, as well as the other parishes in the county were suppressed and Divine Mercy Catholic Parish of Paulding County was established. This next chapter of our story is only now beginning to be written.